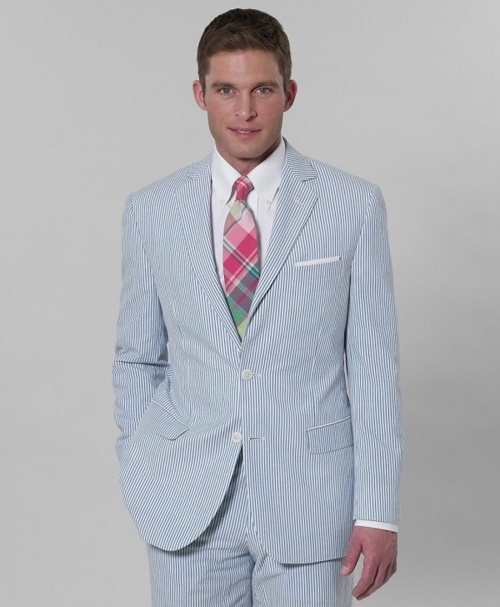 Seersucker is one of those fabrics that officially welcome summer. Sure, the temperature might have reached 90 degrees in early May, but it’s not summer in my mind until you can wear your summer seersucker and madras. Even though your seersucker will always be in style, it’s fun to see the latest from the favorite preppy designers. Here are some of my favorites from this season. To be honest, I am not normally a huge fan of shorts. 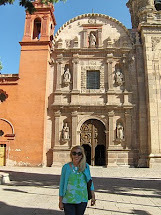 At 5’4” and pear shaped, I always feel like shorts fall at the wrong spot on my leg. Or worse, they have side pockets that pop open, or some other unfortunate detail that is not flattering to me. Seriously, I would rather wear a dress, skirt, or any other thing besides shorts. I even run in a skort from Lucy. But when I saw these Buttercup Shorts from Lilly Pulitzer, I vowed that I would give shorts a chance. And these little seersucker babies didn’t disappoint. The scalloped hem is the perfect length and they are super flattering. Flat across the waist and no puckers or bulges anywhere, although I did stitch the pockets closed. Seersucker is so cool and easy to wear. That’s why seersucker is an ideal choice of fabric for the adorable pajamas from Brooks Brothers. Sleep in cool comfort even on the warmest nights. You’ll look cute, too. Although not every man can be convinced to wear a loud Lilly print, you can pretty much convince everyone in your family to wear seersucker. 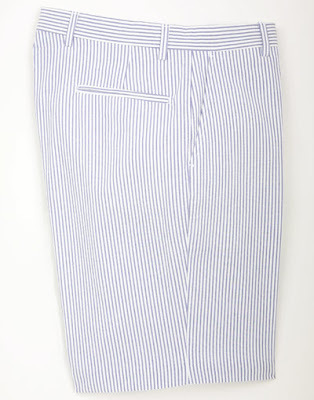 Whether they are for a 5 year old or a 50 year old, seersucker shorts are an excellent choice for the preppy male. Seersucker shorts from J. Press are a preppy summer wardrobe classic. Vineyard Vines includes gorgeous seersucker every season. 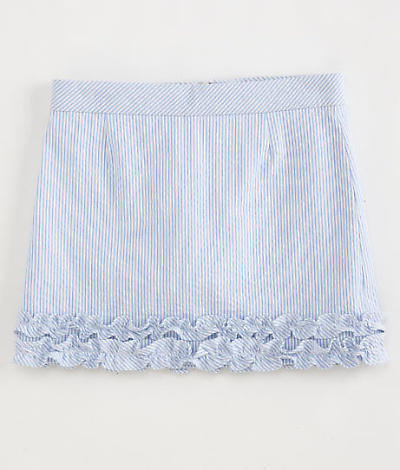 This girls’ skort is adorable and modern with a cute little ruffle. Kicky and fun. Minnie N gives this two thumbs up and is glad that they'll keep her covered while she's riding her bike. Wouldn’t this Vineyard Vines seersucker top in ocean breeze blue look divine in a family beach portrait? With the fabulous seersucker options from Vineyard Vines, you can dress the entire family in style. For a beach portrait, all white, ecru, or seersucker are my favorite colors. 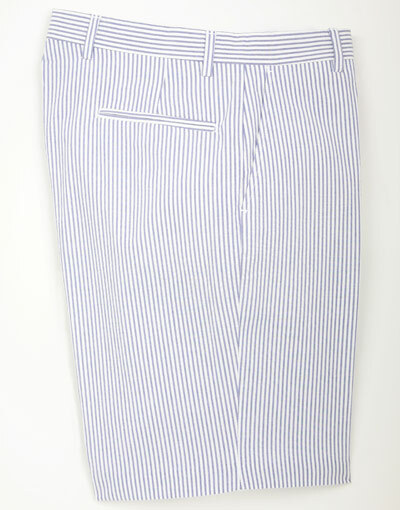 Although seersucker is known as a light summer fabric that is easy to wear, you can also wear seersucker to work. The seersucker dress from LL Bean Signature works in almost any office setting when paired with the right shoes and accessories. Of course, if you’re looking for a seersucker suit, the Fitzgerald from Brooks Brothers is an excellent option. There’s something very attractive about a man in seersucker. It rates a 10 on the preppy meter. Seersucker and loafers without socks get bonus points. What’s your favorite seersucker item in your closet? I love seersucker for myself and guys! I've been loving that little VV skirt. I've thought about getting those Lilly shorts - they are too adorable! Tried on the VV skirt with ruffles the other day and it's pretty short. Cute though! Have a happy 4th weekend! I love seersucker! Those scalloped shorts are fabulous. It is the epitome of summer! I absolutely love the scalloped hem!! It is such a great fit & so classy! I have pink seersucker shorts that aren't scalloped from lilly so I got another pair. I would love the blue seersucker scalloped ones as well!